True to its name, this 4,400-square-foot suite is the epitome of grandeur boasting two floors connected by a private elevator inside. With magnificent gold leafed walls, the living room is filled with natural light from floor-to-ceiling windows and features a six-seater dining table, a grand Upright Piano, state-of-the-art 86-inch TV and Bang & Olufsen 1400 watt speakers with acoustic lens technology for entertainment in exceptional style. For hosting private soirés, the hotel’s Master Chefs can even create exquisite culinary fare in the suite’s fully-equipped kitchen. The suite encompasses two expansive bedrooms and the master bedroom has a private study, 65-inch OLED TV and B&O multi-room wireless speaker. Guests can stay in great shape with the suite’s fitness area and indulge in a massage and luxuriate in the sauna in their own spa room which serves as a personal oasis for rejuvenation. The Lodhi’s signature plunge pool and balcony presenting panoramic views, along with a library, decorative fire place, spacious walk-in closet and cigar humidor complete the experience. 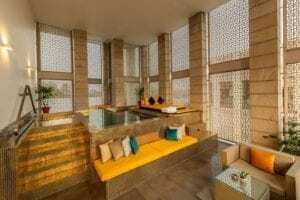 The hotel has also enhanced some of their Garden Terrace Rooms, Garden Terrace Suites and Verandah Pool Suites, which are now named Signature Terrace Rooms, Signature Terrace Suites and Lodhi Signature Suites. These categories offer every conceivable modern amenity, including ultra-plush four poster beds for best quality sleep, comfortable sitting areas, custom writing desks, 65-inch 4K smart TVs and more. All rooms feature ultra high-speed Wi-Fi, complete full bottle private bars, plush PLOH bathrobes, TWG tea selections, Illy espresso coffee machines, universal plug points, USB charging ports, air purifiers, large 5 fixture ‘spa inspired’ bathrooms with bespoke amenities and TOTO automatic toilets. 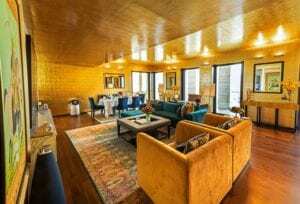 Art inspired by Indian history, art-deco styled lavish furniture, warm wooden flooring with custom wool and silk carpets provide the ultimate opulence. If you are looking for an adventuresome food travel, here are some of the top buggy wormy things to eat around the globe.